Central to the Australian meaning of drought is the idea of a rainfall deficiency, a term that suggests less than “normal”. But what is normal and how should it govern drought policy? In this part of our series The New Normal, we look at the history of drought policy and how the conversation is changing. Away from the glare of nightly television reports showing farmers feeding starving stock, there is a more complex conversation going on among landholders. It discards the idea that policy should be built on the notion of average rainfall, and instead accepts Australia has a drying climate where wet seasons are the exception rather than the rule. It accepts that governments need to put in place a framework for encouraging good management practice for farmers, not only as food producers but environmental stewards, given they manage 60% of the Australian landmass. Most farmers recognise this is not a discussion about immediate drought relief measures for people on the land who have been suffering with the reality of this dry period. Rather it is a conversation about the longer-term settings for agriculture in a changing climate. The politics of drought intersects with two recurring but contentious assumptions: that weather can be divided into normal seasons and abnormal seasons; and that the government has a special responsibility to preserve the agricultural “way of life”. When the prime minister, Scott Morrison, visited drought-affected properties in south-western Queensland, he was asked why a farm business should get assistance when a business struggling in his own electorate would not qualify. Morrison said when the Kurnell oil refineries closed down in his electorate of Cook, the employees were able to find work in other parts of the city – an option rural people did not have available. More than that, he said rural communities were providing food and fibre, “what Australians need”. “It is different in different parts of the country. As a result of that, I think that means there’s a special responsibility here,” Morrison said. The overwhelming issue for drought policy is that it is often conceived in the grip of an emotional debate in dry times. As a result, the line between good policy and good politics is blurred. Australian governments have been trying to drought-proof the country since settlement. It has been a history of subsidies in cash and fodder. The irrigation schemes of the 1970s and the natural disaster funding arrangements were attempts to find a way through the cycle of drought. A federal government review in 1989 acknowledged that drought funding distorted the industry and discouraged farmers from preparing for dry times. Under the National Drought Policy from 1992, assistance was centred around an Exceptional Circumstances (or EC) model. “Exceptional” required that the drought must not have happened more than once on average in every 20 to 25 years and be of significant enough scale to result in a severe downturn in farm income. In 2008 – at the tail end of the Millenium drought – commonwealth and state ministers and farm groups backed the removal of the EC program and commissioned a review by the Productivity Commission. The PC found in 2007-08 that 23% of Australia’s then 143,000 farms received drought assistance worth more than $1bn, “with some on income support continuously since 2002”. But it found a broad range of performance by farm businesses. In 2005-06, the largest 30% of farms generated 82% of the value from agricultural operations, whereas the smallest 50% generated 7%. The bottom 25% of broadacre farms had not recorded a profit in any year from 1988-89 to 2007-08. The PC concluded “Australia has always had a variable climate, with drought being a recurring feature” and “experts predict higher temperatures and, for some regions, more frequent periods of exceptionally low rainfall”. The Gillard government dropped the EC program and took up the PC recommendation for a body to oversee drought policies, the Standing Committee on Primary Industries (Scopi). Commonwealth and state ministers, including from Coalition states, signed the Intergovernmental Agreement on National Drought Program Reform (IGA), and Scopi was to provide the machinery for policy. The PC recommended an extension of research and professional development for farmers to build self-reliance, support for Farm Management Deposits (FMDs), which allow tax-effective savings in good years. It suggested conditional income support to all farm households “regardless of cause or location”. After the EC was dropped, assistance was split between “food on the table” funding or farm household allowance payments, and business initiatives such as tax-effective FMDs, concessional loans and money for financial counselling. By 2013, the then president of the National Farmers Federation, Brent Finlay, said he approached both sides of politics (when Australia was relatively free from drought) to formulate a more cohesive policy – but could get no traction. “Labor said they would do a policy before the 2013 election. [Former Coalition agriculture spokesman] John Cobb said there would be something on drought. When Barnaby [Joyce] was appointed, he said it will be in the agriculture white paper. It was not there,” Finlay says. With the election of the Abbott government, Joyce increased funding available for concessional loans and water infrastructure, partly funded by money taken from Landcare programs – which he justified as assisting “sustainable agriculture”. In 2014, as Queensland slid into the state’s most widespread and ongoing drought, the Abbott government announced further funding was released for concessional loans, pest management, mental health and water infrastructure. But the Coalition had also abolished Scopi, with its focus on policy work, and replaced it with a one-off annual meeting of ministers, Agmin, which performed a different function. The IGA has been extended past its expiry date of July 2018, but only in the absence of a new agreement. Agriculture minister David Littleproud rejected the suggestion that intergovernmental agreement was in danger, saying the July deadline was set simply for a review. He said drought policy would be examined at the national drought summit, called by Morrison for 26 October. Littleproud acknowledged farmers have been dealing with climate change since they first “put tills in the soil”. He said a $300m funding injection for research and development was vital to help farmers adapt and maintain productivity and profitability. The minister, a former rural banker, said financial literacy had improved in farm businesses but he urged accountants to work with farmers to have “honest conversations” around budgeting and management decisions. Littleproud said better land management would bring back environmental, social and economic benefits, known as the triple bottom line. He said funding for wild dog fencing and pests, had improved ground cover, created the return of bird life and koalas and allowed farmers to return to sheep over cattle. “We’ve seen a triple bottom line improvement – [the reintroduction of] sheep and shearers … human labour leaves money in town, at the pub, at the cafe, it is so important to local economies,” Littleproud said. The distinction between welfare-type payments and business payments continues in drought policy, but it is still an extension of Australia’s historic approach. More recent examples of “initiatives” this year reflect tweaking around the edges rather than a wholesale change in thinking. Before his political demise, Malcolm Turnbull increased the assets limit for household welfare payments to $5m plus supplementary payments of $12,000. There are still tax concessions for fodder storage from the 2015 Abbott budget. 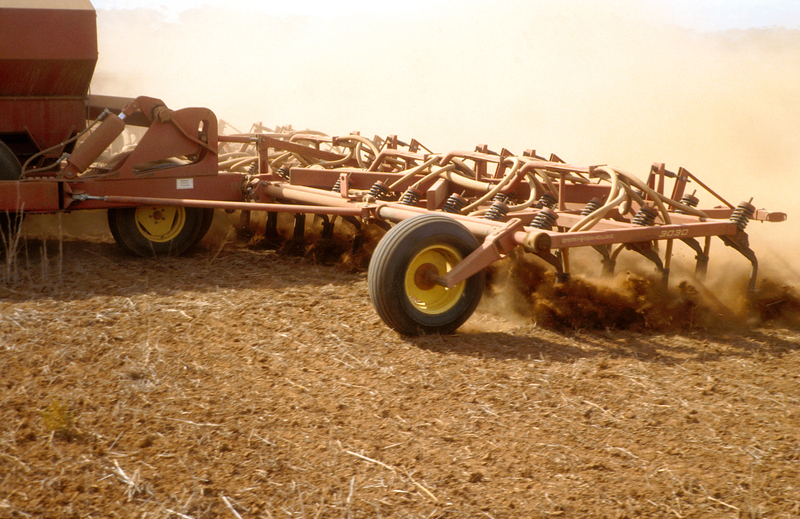 Pest and weed management, concessional loans and farm risk insurance rebates remain staples. The federal government also funds social supports such as mental health measures and drought community infrastructure projects. State governments provide transport subsidies, which some farmers say distort the markets by increasing prices, as well as “innovation” funding, which requires the landholder to contribute for things such as more efficient water usage. The government has also allowed greater flexibility around Farm Management Deposits – allowing savings to be set aside tax-free for low-income years. At the end of August, total FMDs amounted to $5.5bn, not yet accessed by farmers who own them. The total amount in FMDs has increased in value from $5.2bn in January, in spite of the drought. It means some farmers are still earning income. Still, the National Farmers Federation has been critical of the lack of a national drought framework. The NFF president, Fiona Simson, recently criticised the Coalition government for the lack of a comprehensive policy and declared climate change was exacerbating the effects of drought. Yet the NFF has no proposed drought policy on its website and did not comment for this article. On the ground though, the conversation has morphed into new ways of thinking about dry times. Sue Middleton, a WA agribusinesswoman who has served on many government boards, says she would drop the word drought altogether, in relation to policy, and thinks it’s a mistake to frame it as disaster because that suggests a lack of control. “What I’m saying is [it’s] of zero use to people right now in current circumstances – because I am talking about a 10-20 year investment that can make a difference,” she says. Middleton urges government to think differently of policy; to improve the long-term settings for agriculture to make sure it is positioned for the next decades. That means looking at ways to increase efficiencies and improve farmer education but also to improve customer value. “I would take the word drought out of our language and talk about risk, talk about how to manage adverse times and how we prepare, and what that requires,” Middleton says. Middleton uses the example of 10 years of Western Australian government investment and research on best practice for water-use efficiency. The work means WA farmers are achieving efficiencies “beyond the charts”. She says “using rainfall to optimise a farming system” is just part of managing one of the risks. Middleton says the elephant in the room is the low rate of return for farmers, which means 50% of farmers are making below 3% – a profit line that makes it hard to build resources for dry times. Finlay also argues that farmers acknowledge “drought is a regular part of agriculture and with climate change we will potentially see more and more”. He believes farmers need a more independent government process for dealing with drought that’s separate from the politics of the day. He argues dry spells could be monitored using the best data from the CSIRO and the Bureau of Meteorology. When the outlook turns towards dry periods, conditional government assistance would reward “good management decisions”. Finlay also wants to see a drought commissioner in the prime minister’s office. Significantly, this would place the position out of the control of subsequent agriculture ministers and their links with industry. “For any minister of agriculture, you are also the environment minister because it is landscape management,” Finlay says. There is a growing view on the ground in drought-affected regions that throwing money at individual farmers doesn’t work, unless it goes towards long-term or structural projects that change people’s capacity to cope with dry times. In Queensland’s Augathella, Doug and Rachelle Cameron, who run their Nive beef cattle and jerky business, say while farmers appreciate metropolitan support, one-off donations of fodder or cash do not go far. After three bores collapsed, Doug says the water funding – which required them to contribute half – allowed them to renew infrastructure that would last 30 years and increased the value of the farm. “Things like that to drought-proof is better than flicking $20 cash,” he says. Peter Schmidt, a grazier in Wyandra, near Cunnamulla, who has been in drought since 2012, says most good managers should have enough resources to deal with dry periods for two years. He still favours infrastructure grants for long-term drought proofing and believes there is value in wheat subsidies. Schmidt is a rural scientist who worked on the Bjelke-Petersen government’s drought programs in the 1980s and formed OBE organic beef. He says he would like to see more conversation between rural and metropolitan communities around the value of food and the agricultural industry. He believes European countries have a closer relationship between their city and country towns compared with the high degree of urbanisation in Australia. Originally published by The Guardian, 5 October 2018.